The WA Open Dancesport Championship is an event with a 32-year history, rich with consequence and stature not only in WA but also across the nation. This year the organising committee continued that stirling tradition of high-level competition and highly entertaining show and cabaret elements that have created the Championship’s reputation as the premier event of the local DanceSport calendar. Made up entirely of volunteers, the organisers of the WA Open should be commended on delivering an event that not only maintained the status quo but pushed the boundaries as to what can be expected for the state Championship. Several new categories, including studio team events, were introduced, as well as the inclusion of a fabulous social dance, complete with live band, at the conclusion of the evening. 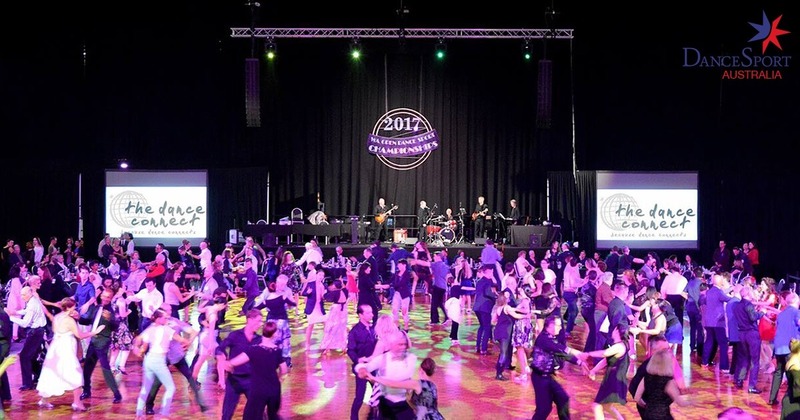 These changes all worked to realise the organisers’ vision of expanding the WA Open’s audience beyond the close-knit community of competitors, family, friends and professionals, to the much more diverse population of social dancers and enthusiasts. This plan was successful and brought new life to the event, hopefully ensuring its prominence for another 32 years. The event commenced by featuring WA’s booming recreational, teacher/student and pro/am divisions. These events have taken on a life of their own in the West, so much so that the organisers were required to offer Beginner and Open Recreational division events across all ages and styles. Reflecting the depth of the field. These events are run at a DSA ‘competition’ level, affording opportunity for the new cohort of WA adjudicators to be a part of the panels for the morning section. Their fresh and enthusiastic faces are a welcome addition to the already knowledgeable and lauded collection of professionals in WA. As the morning segued into the afternoon there was electricity in the air as the DanceSport division competitors made their way into the stadium and began their preparations for a day of hotly contested battles. With a majority of the Open Championships not being contested by the winner from the previous year, the opportunity to be named Champion proved to be a prize too tempting to resist. All the competitors were fired up, if not to grab the trophy then to claim that higher position that had previously eluded them. The evening session then commenced, with events to decide whose names would be added to the trophies alongside previous champions such as Jason Gilkison and Peta Roby or Paul Green and Karen Rufus, to name just a few of the many from WA who have gone on to become legends of DanceSport worldwide. The show was, as always, masterfully compered by Adam Penn, who also entertained and delighted audiences with a rendition of ‘Love is in the Air’ accompanied by several of our local dancers. Also featured on the evening was a sensuous and sultry Tango performance by Damon and Rebecca Sugden. The combination of movement, music and costuming enthralled the audience and brought the large stadium to silence. Special mention must be made of the event’s sponsors, particularly the naming rights sponsor, Healthway. If not for their support, and generosity of the other sponsors, DanceSport in WA would not be possible on such a scale and at such a high standard. Preparation is, of course, already under way for next year’s Championship to which the organisers hope to welcome even more competitors and demonstrate the best that the West has to offer.